President Trump has a message for Wells Fargo: We're not letting you off the hook. "Fines and penalties against Wells Fargo Bank for their bad acts against their customers and others will not be dropped, as has been incorrectly reported," Trump tweeted on Friday. Trump's comments about an ongoing enforcement action are unusual. Reuters reported the day before that Mick Mulvaney, Trump's temporary pick to run the Consumer Financial Protection Bureau, is reviewing a proposed settlement that would penalize Wells Fargo tens of millions of dollars for alleged mortgage lending abuse. Mulvaney previously told the Washington Times that he is reviewing 14 open enforcement matters. Mulvaney has accused the CFPB, an aggressive consumer watchdog, of "trampling on capitalism." While Trump has condemned the CFPB as a "disaster" that has "devastated" banks, he signaled Friday that Wells Fargo is still very much in the regulator's crosshairs. The president tweeted that fines and penalties "will be pursued and, if anything, substantially increased." Reuters reported that Richard Cordray, who set off a CFPB power struggle when he stepped down last month, approved a possible Wells Fargo settlement that called for the bank to pay tens of millions of dollars. Asked about Wells Fargo at his first press conference as acting director, Mulvaney said he remains "disturbed" by the scandals at the bank. The CFPB did not respond to a request for comment. Wells Fargo declined to comment. Related: GOP says CFPB is crippling the economy. Really? Wells Fargo has previously said the CFPB is investigating the alleged mortgage lending abuse. In October, Wells Fargo said some mortgage borrowers were inappropriately charged for missing a deadline to lock in promised interest rates, even though the delays were the bank's fault. Wells Fargo promised refunds for any of the 110,000 customers who were wrongly charged so-called "mortgage rate lock extension fees" between September 2013 and this February. In his Wells Fargo tweet on Friday, Trump said that while he wants to "cut" regulations, he will "make penalties severe when caught cheating!" Wells Fargo's (WFC)stock was mostly unfazed by the Trump threats. After initially dipping slightly on the tweet, Wells Fargo stock quickly recovered and was trading slightly higher on the day. "Wells Fargo will remain a political punching bag ... until the bank makes additional changes at the very top," Jaret Seiberg, financial services analyst at Cowen Research Group, wrote in a note on Friday. Tim Sloan, a Wells Fargo veteran, was promoted to CEO last year to clean up the bank's scandals. 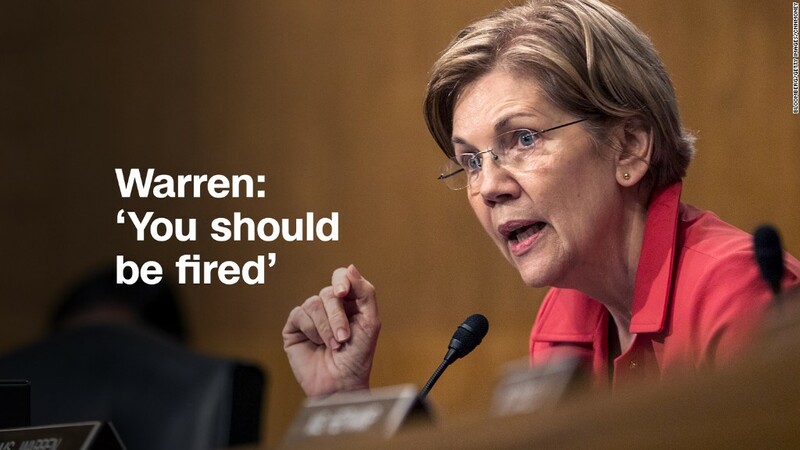 Democratic Senator Elizabeth Warren has called on Wells Fargo to further clean house by firing Sloan. Earlier this year, Trump took a softer tone towards banks. Bank CEOs are "petrified of the regulators. They're petrified. They can't move," Trump said at an April town hall event with Citigroup (C) boss Michael Corbat and other business leaders. The president also promised to do a "very major haircut on Dodd Frank," the Wall Street reform law enacted in 2010. Wells Fargo's troubles began last September when it admitted to firing 5,300 workers for creating up millions of fake accounts. The scandal brought to light a rotten sales culture at Wells Fargo illustrated by unrealistic sales goals and extreme pressure on employees. The bank has since revamped its sales targets, fired managers and installed new senior execs and directors. Besides the mortgage issues, Wells Fargo has also admitted to charging thousands of customers for auto insurance they didn't want and has been accused of cheating mom-and-pop shops on credit card fees. Earlier this week, California regulators blamed Wells Fargo for the sale of nearly 1,500 unauthorized insurance policies. "Many customers complained they simply had no knowledge of ever signing up for such policies," the California complaint said.